You can honestly say of this film by writer/director Macon Blair that they don't make 'em like they used to. 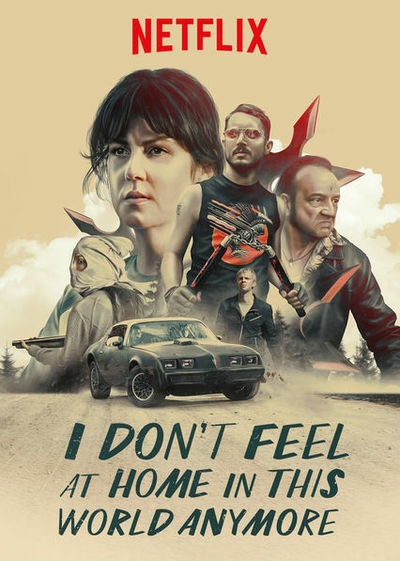 "I Don't Feel at Home in This World Anymore" is an American independent film from the 1990s that just happens to have been released this year. The stakes are small compared to what tends to happen in American movies now; the story is rather slight; the filmmakers pay closer attention to the small details of character interaction than to the fine points of plot. The whole thing is mainly situational: we get to watch the heroine, Ruth Kimke (Melanie Lynskey) as she reacts to having her house broken into and follow along as she decides to locate and punish the people who did it with help from an oddball neighbor (Elijah Wood's Tony), who's enamored with morning stars and nunchucks. Really, though, this is a film about the utter indifference and outright hostility that people encounter every day, and how essentially decent people like Ruth suffer and suffer through it, almost always silently, until they finally snap. The break-in is the culmination of a series of unfortunate encounters: she has to deal with an old racist at the nursing home where she works. She gets stuck in traffic and spies a jerk in a pickup truck at the head of the lane whose tailpipe spews inky smoke as he revs his engine. In a scene that will break the hearts of many regulars who read reviews, Ruth enjoys a drink at a neighborhood bar while reading a new book, only to have a plot twist casually spoiled by another customer that she initially mistakes for a nice guy (played by Blair himself). The film is worth seeing for its interest in eccentric but realistic people, in particular Ruth, who's played with great intelligence and exactness by Lynskey. Lynskey, who first came to moviegoers' attention in "Heavenly Creatures," is one of those actresses I'm never not glad to see, and it's a treat to see her front-and-center here, carrying an entire movie mainly with her eyes, face and shoulders. A performance like this one can be quite tricky—you're essentially reactive a lot of the time, more of a sponge for the film than the motor driving it along—but Lynskey makes everything active by letting you feel Ruth's emotions and sense her train of thought as she puts various pieces together in her head, drawing correct or wrongheaded conclusions. She's also just a terrific audience surrogate. When she snarls or snaps, I wanted to cheer.